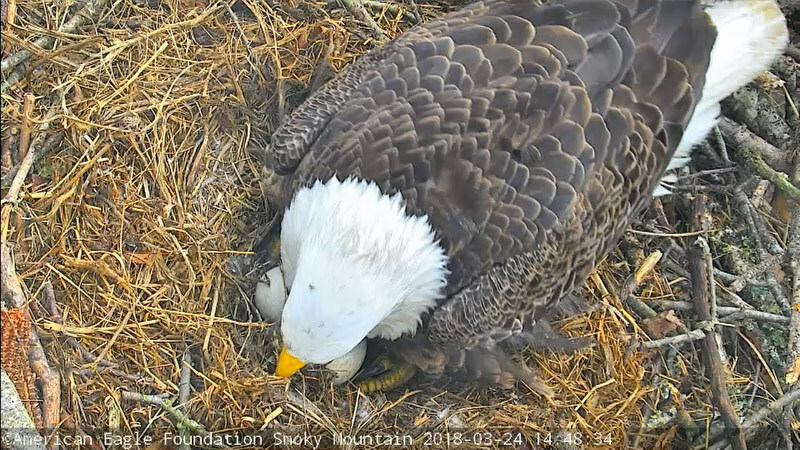 “Lady Independence” and “Sir Hatcher” are a wild pair of bald Eagles that took up residence just miles from the American Eagle Foundation and have produced several young since 2013. After the pair built their first nest in Sevier county in 2011, local wildlife photographers noticed that the larger eagle (thus most likely female) was wearing a metal leg band. It wasn’t for a couple of years, however, (in 2014) that enough telephoto photos were taken by AEF Volunteer John Prickett and friend David Collins to be pieced together. This allowed AEF to read the ID number on the Eagle’s metal leg band. To everyone’s surprise, it was revealed to be a female eagle that actually came from the American Eagle Foundation. This female was hatched and raised by non-releasable Bald Eagle breeding pair Independence and Franklin at Dollywood and was then released into the wild in 2008 from AEF’s Hack Tower on Douglas Lake! 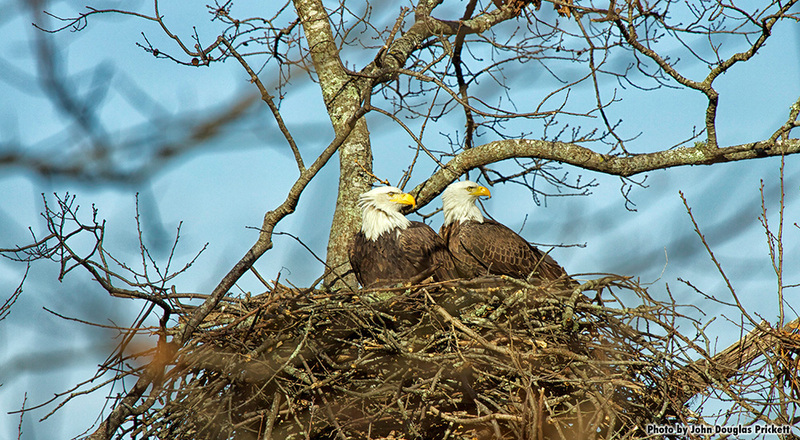 “It’s just so good, such a great feeling to know that some of that youngsters have survived long enough to come back to this area, build their own nest, and raise true Tennessee eagles right here in the heart of Sevierville,” Al Cecere, founder of the American Eagle Foundation, says. After Bald Eagles become sexually mature (at about 4 to 5 years of age) and choose their life-long mates, they tend to return to the general area where one of the pair first learned to fledge, or fly. It turns out that after fledging into the wild from the hacking tower on Douglas Lake, this female Eagle decided to return to the Pigeon Forge area 3 years later with her mate to build their first nest! The AEF named her Lady Independence, in honor of her mother. Her mate was named Sir Hatcher in honor of AEF friend, mentor, and supporter Bob Hatcher, the man who made the AEF’s hacking program possible in the early 1990s. In 2015, a camera was placed on the roof of a house near the nest so the public could watch the pair’s activity from the ground. In the fall of 2016, after the pair had left the area, the AEF worked hard to install camera and audio equipment high the nest tree area to watch all of the activity with a bird’s eye view. However, it seems that the pair had plans of moving…just 600 feet away to a newly built nest! 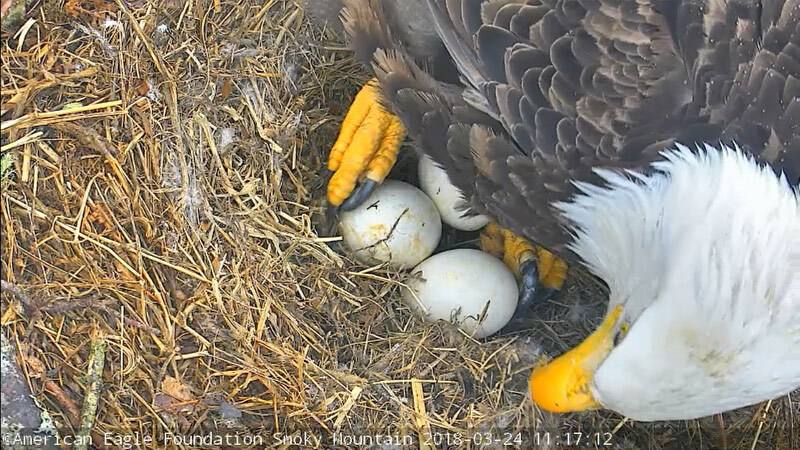 After the eagles leave the area in the summer of 2017, the AEF plans to install a camera over the new nest. In the meantime, a long-range camera will be installed about 600 feet from the nest from the new nest monitoring purposes. 2011-2012: “Lady Independence” and “Sir Hatcher” build a nest in a tree on Winfield Dunn Parkway close to a Kroger supermarket in Sevierville, TN. Unfortunately, this nest was not constructed on sturdy tree limbs, and the nest blew out of the tree during a storm. It was unknown if there was eggs in the nest that year. 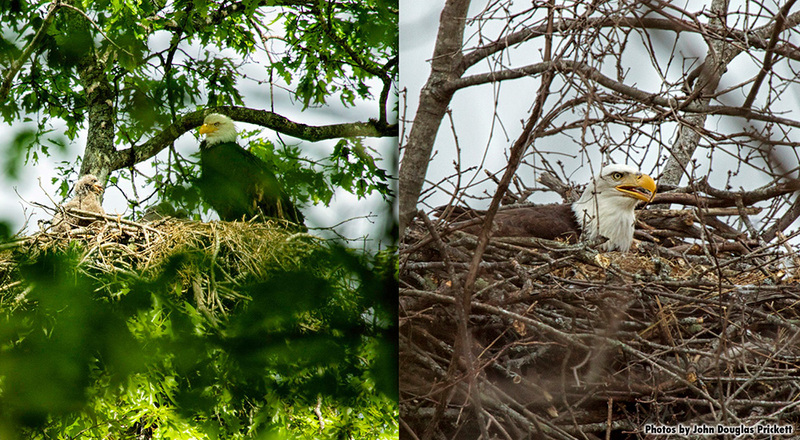 2012-2013: “Lady Independence” and “Sir Hatcher” build a second nest in the same tree. They produced two young. The two little eaglets were thriving, and had reached the age of 6 weeks when another huge storm passed through. Unfortunately, the nest was severely damaged and both eaglets fell to the ground. John Prickett immediately checked on the nest after the storm had passed, and notified Al Cecere. Together, along with AEF staff members Michelle Bauer and Karen Wilbur, they combed through the thick thorn brush below the nest in search of both eaglets. The eaglets were found, and taken to the AEF facility for initial evaluation and treatment by AEF’s vet tech Nancy Zagaya and UT veterinarian Mike Jones. One Eaglet sustained permanent injuries to his wing. He was named “Abraham” and now permanently lives at the AEF as an educational ambassador as the grandchild of Independence & Franklin. The sibling required one year of rehabilitation and was released into the wild in 2014 (watch the video https://www.youtube.com/watch?v=aTJnjxIHjOA). Unfortunately he did not survive his first year. Later that year, during the government shutdown of 2013 (Oct 1-13), a land developer illegally (intentionally) chopped down the Eagle pair’s nest tree so he could develop the land. 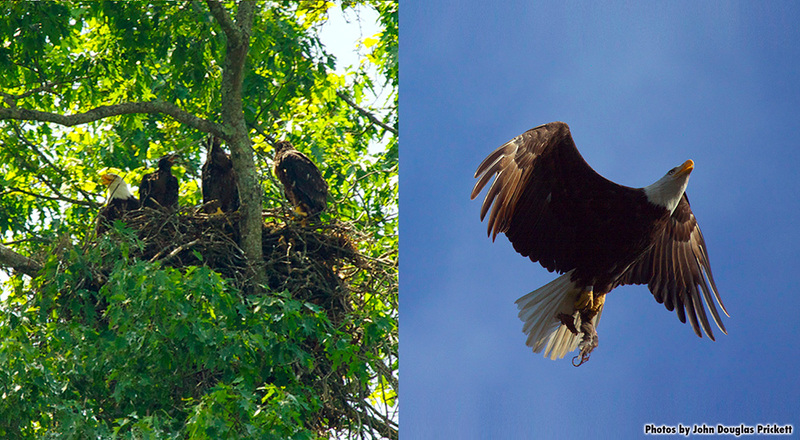 2013-2014: The pair built a new nest in the same general area, but several miles from their original nest tree. This time, the nest was much sturdier and located in a more protected tree. On March 9th 2014, John Prickett and friend, David Collins, were able to put their images together of the band on Lady Independence and discovered that she was in fact one of the birds released by the foundation. They hatched, raised, and fledged two young. 2014-2015: “Lady Independence” and “Sir Hatcher” successfully hatch and raise 3 young. Mid-season, the AEF installs a Nest Cam several hundred feet from nest. All three fledged on June 13, 14, and 15, and the public got to watch online! 2015-2016: The pair once again successfully raised three eaglets, which fledged on June 18, 19, and 20! In the fall, the AEF installed camera and audio equipment over the nest, to finally create an up close cam viewing experience. 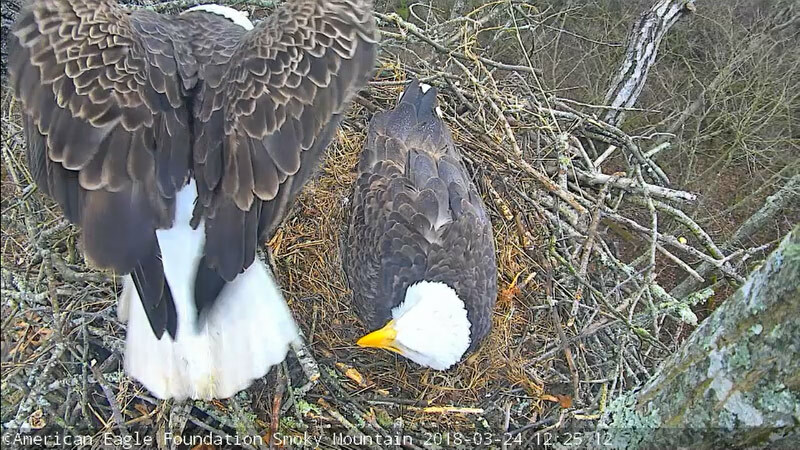 When the pair returned to Sevier County later that year, however, they decided to build a new nest about 600 feet away from their previous one. 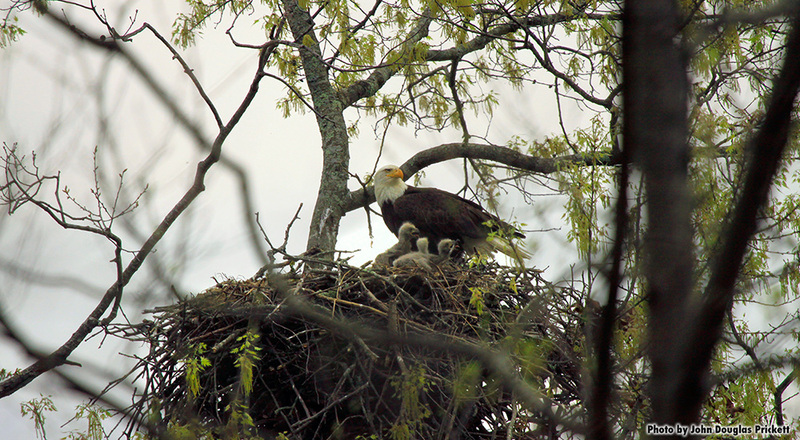 2016-2017: Lady Independence and Sir Hatcher raised and fledged three eaglets. We only had one wide angle cam on the nest and so we were not able to see nest activity very well. Additional cams have been added in hopes we have a better viewing experience for the next season. In the slideshow below, Sir Hatcher II is seen rolling the eggs and looking straight up at the camera! Three slides show a “shift change” when Sir Hatcher comes in to relieve Lady Independence, who is shown brooding the eggs. We have no idea where the original Sir Hatcher is, whether something happened to him or whether Lady simply changed mates. Eagles typically mate for life, but in rare cases, they will change mates. 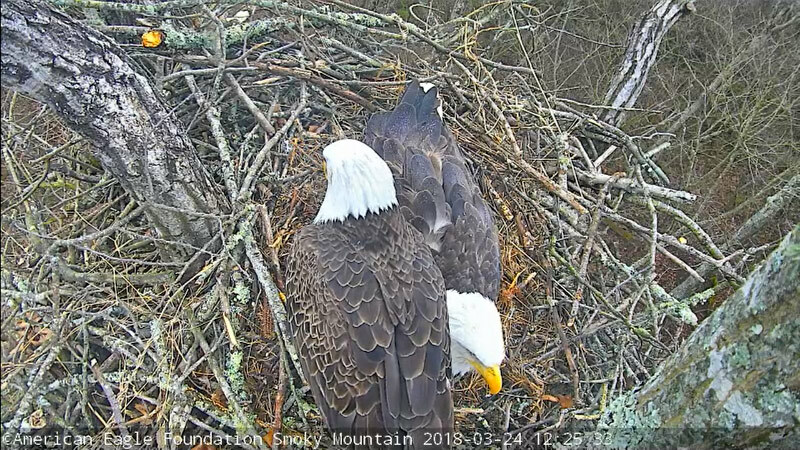 Mr. Collins made many attempts to capture the new male’s band number, but it wasn’t until March 23, 2018 that AEF staff (Crystal Slusher & Michelle Bauer) and the SM Eagle Cam Liaison (Debi Chernisky) were able to utilize the newly streaming cams to obtain the new male’s band number (USFWS #629-43867). 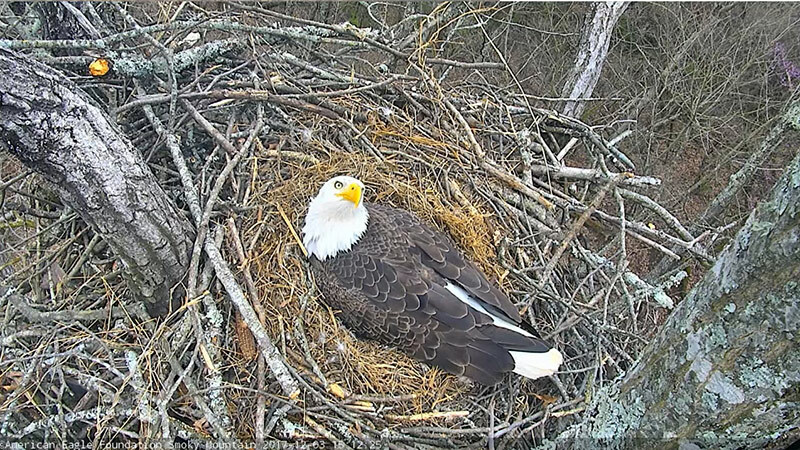 A third adult eagle has been seen at the nest, but we do not know whether this is a male or female. 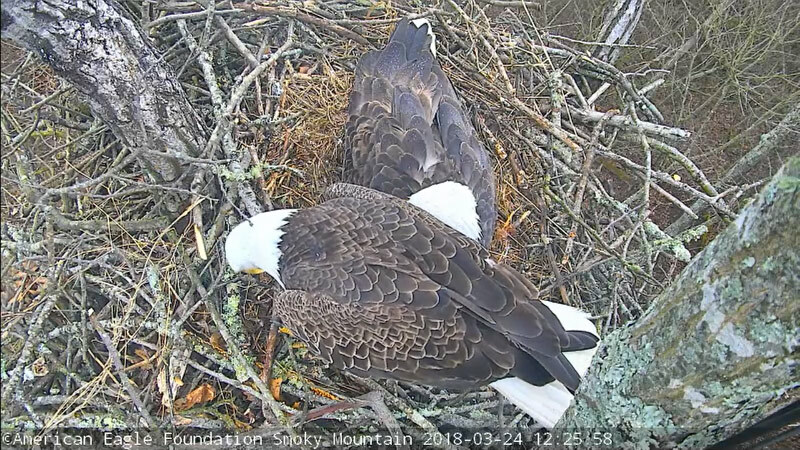 The nesting pair (Independence and Sir Hatcher II) have generally been tolerant of this eagle when it perches in the nest tree; however, at other times, it has been driven away from the nest. Could this possibly be the original Sir Hatcher? We just don’t know.